Accurate liquid level measurement is critical in the food and beverage, pharmaceutical, and biotechnology industries. Various technologies have been developed for measuring liquid levels in a range of sanitary applications, including float, reed chain, magnetorestrictive, and optoelectronic methods. All of these methods, however, have notable differences in terms of accuracy, size, and ease of calibration and cleaning. Optical level switches are one of the newest methods for monitoring liquid levels in the sanitary industry. The WIKA Model OLS-F1 Optical Level Switch is specifically designed for the sanitary industry, and it offers a number of advantages over traditional level switches, especially in terms of its compact design and autoclavability. Optical level switches sense the level of the liquid in a vessel using light. These devices operate using an optoelectronic sensor that monitors the liquid level in a pipe, tank, or other vessel. The sensor itself is an infrared LED emitter and a photo-transistor receptor assembled as a single unit. The light from the LED is focused within the prism at the tip of the sensor. While the sensor tip remains above the liquid, the light is reflected within the prism to the receptor. However, when the liquid level reaches and covers the tip, the light beam is interrupted, and the light no longer — or only weakly — reaches the receptor. The light receptor reacts instantly to this change and initiates a switching operation within milliseconds. The WIKA Model OLS-F1 Optical Level Switch has been designed to solve several long-standing issues in the sanitary industry. 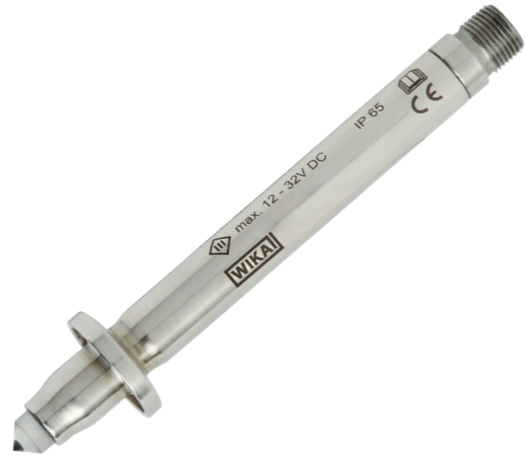 This very small level measurement unit will fit in almost any process pipe or tank, process connection down to a 3/4” tri-clamp. The electro-polished surface finish substantially reduces product contamination and adhesion due to the microscopic smoothness and shortened cleaning cycle time. This user-friendly level switch is accurate to +/- 0.5 mm, and can be mounted vertically or horizontally. This level switch can be supplied with various sanitary process connections: tri-clamp per ASME BPE, DIN 32676, clamp per ISO 2852, and other industry standards. Sanitary industry executives and process engineers have been lobbying for autoclavable instrumentation for years, and WIKA continues to deliver with new products designed to meet industry needs. With the OLS-F1, autoclaving operations can be safely conducted up to a temperature of 134°C. Why take chances by using level measurement devices that were not specifically designed for the stringent requirements of the sanitary industry? With the WIKA Model OLS-F1 level switch, you can be certain you are using the right instrument for the job. These robust, accurate switching devices can be assembled to virtually any process vessel, will minimize contamination, and can be cleaned quickly and easily. WIKA’s team of highly trained technical support staff are more than happy to answer any questions you have about optical level switches or about our line of award-winning line of sanitary industry products.